Install LAMP would be the basic skill for a Linux admin. 1. Before installing PHP5 dynamic language support for Apache, get a full list of available PHP modules and extensions using the following command. # DirectoryIndex: sets the file that Apache will serve if a directory is requested. # This actually allows you to specify a default page to display when a directory is accessed. To get a full information list on PHP from your browser, create a info.php file on Apache Document Root using the following command from root account, restart httpd service and direct your browser to the http://server_IP/info.php address. 4. If you get an error on PHP Date and Timezone, open php.ini configuration file, search and uncomment date.timezone statement, append your physical location and restart Apache daemon. 1. Red Hat Enterprise Linux/CentOS 7.0 switched from MySQL to MariaDB for its default database management system. To install MariaDB database use the following command. 2. After MariaDB package is installed, start database daemon and use mysql_secure_installation script to secure database (set root password, disable remotely logon from root, remove test database and remove anonymous users). 3. To test database functionality login to MariaDB using its root account and exit using quit statement. Now from another computer open a browser, type the following as url: “IP_of_LAMP_host/wordpress ” , you should see the wordpress installation page. If you find it struggle to use the Mysql command, you can install the PHPMYADMIN to create a user, DB from a GUI. How To Enable EPEL Repository in RHEL/CentOS 7/6/5? First, you need to download the file using Wget and then install it using RPM on your system to enable the EPEL repository. Use below links based on your Linux OS versions. (Make sure you must be root user). In Apache you don’t need to configure anything for phpMyAdmin, because you will get working phpMyAdminautomatically at the address http://<ip address>/phpmyadmin. The main configuration file is located under /etc/httpd/conf.d/phpMyAdmin.conf, make sure the Require all granted directive (For Apache 2.4) and Allow from ip address is added inside the Directory /usr/share/phpmyadmin block. Finally, restart Apache to apply changes. Finally, restart Nginx and PHP-FPM to apply changes. Download the tar ball from https://www.phpmyadmin.net/downloads/, choose the one end with tar.gz. copy the url, past to the putty to download. Extract package rename the folder to phpMyadmin and move to the /var/www/html. Now the PhpMyAdmin is ready to use. Open your browser and point your browser to http://<ip address>/phpmyadmin. 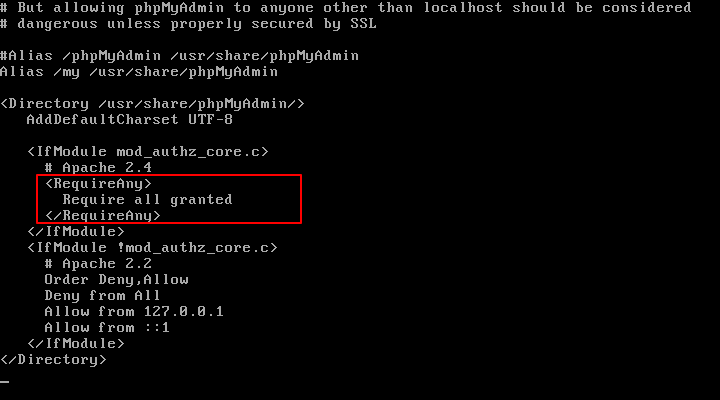 It should open the phpmyadmin interface, type root as the user name and password you created in mysql_secure_installation.